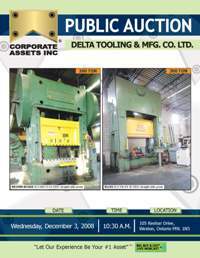 Corporate Assets Inc. | Delta Tooling & Mfg. Co. Ltd. - Corporate Assets Inc. FEATURING: BROWN BOGGS SC2-200-72-42 S.S, BLISS SC2 350 84 x 36 S.S. presses, STEELWELD 500 ton S.S., BROWN BOGGS 20 LJ 110 ton A/C OBI press, straighteners, feeders, uncoilers, OBI presses, radial arm drill, machine shop, factory equipment, over 100 tote/parts bins, etc.